It's been a few years since my very early post on gas mileage and the feasibility of converting to a hybrid, so I think it's time to revisit for my reader(s). As a certified numbers geek, I record all of the mileage and gas information every time I fill up my car (a 1997 Ford Explorer with very little else to recommend it unless you count "character" dents). Every few years, to the chagrin of my loved ones, I sit down and type all of the numbers into a spreadsheet and make pretty graphs. 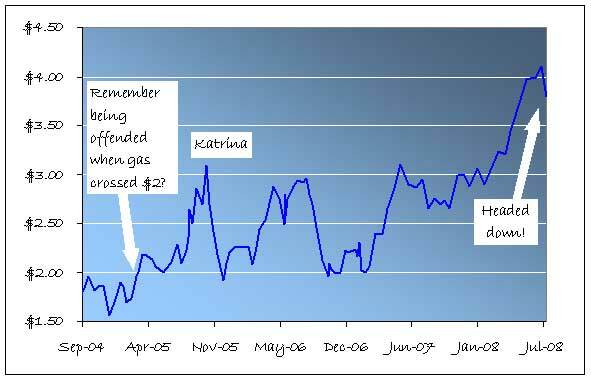 Like this one, showing the price of gas over the last few years. 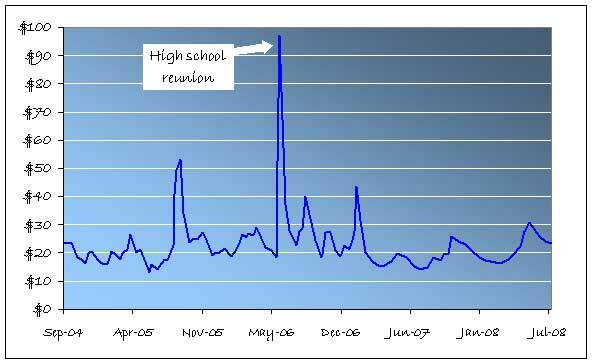 The big spike is from the weekend that we drove a few hundred miles to my 20th high school reunion (old I am indeed). Usually we take the family minivan/mobile restaurant/garbage collector on such trips, but this one was taken sans offspring. The mobile entertainment unit was left behind so that the grandparents could tote the kids around in our absence. Long trips in the Explorer are few and far between due to my wife's insistence that it is "as comfortable as pine bench seats at a Pentecostal tent revival" (paraphrasing). That highway-only reunion trip made for some great MPG numbers. 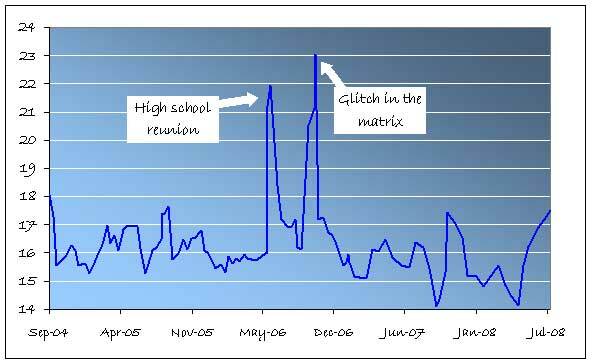 The other spike is only explainable by my writing down the wrong mileage numbers one time or by a secret conspiracy by the Ford Motor Company to exaggerate the capabilities of obsolete vehicles. Over the last few months, I've been trying out some of the hypermiler techniques (not the crazy things like turning off the engine or drafting behemoths, but the coasting and slow acceleration stuff), which is why the mileage goes up towards the end. 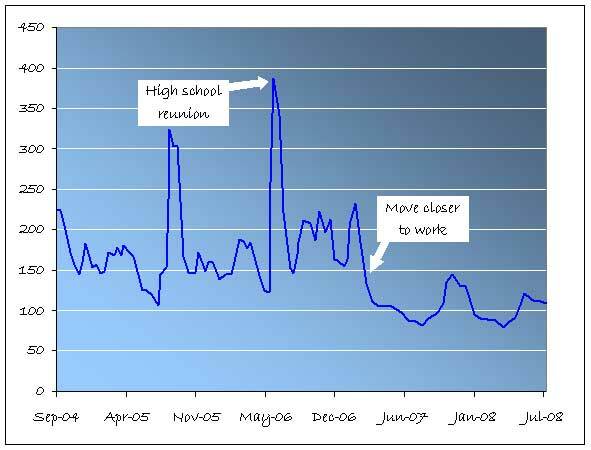 Or it could be a statistical anomaly. I'm sticking with the former, as the latter implies that I'm aggravating other commuters unnecessarily. I'm using the high-end MPG estimates here to get the most favorable pro-hybrid results. KBB claims I could get about $2000 in a trade-in on my Explorer, but I seriously doubt it. Let's use $0 for the trade-in and assume I'd just keep the truck for hauling supplies to various charitable functions and lugging 2x4s to build play structures in the backyards of unsuspecting neighbors. Since the last analysis, there have been some major changes. Gasoline, of course, is more expensive. However, due to demand the price for a hybrid has also risen - exacerbated by my now worthless trade-in. Also, I drive about 75 fewer miles a week than the last time this exercise was attempted. As a result, it now makes even less sense to buy a hybrid for the fuel savings. 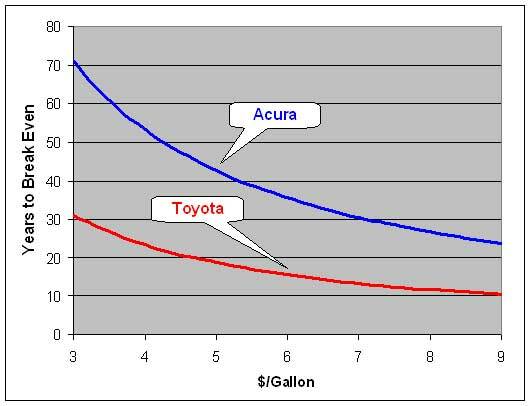 Even if gas rose to $9 a gallon, it would still take over 10 years to make up the price of the cars through fuel savings. In fact, gas would have to rise to over $42 a gallon to pay off the Prius in 5 years - at which point the country would be in flames and driving to work would be the least of my worries. I agree that gas is too expensive, and I'll probably be one of the first on my block to buy an all-electric vehicle. But it won't be for the gas savings alone. Those numbers still just don't work out.